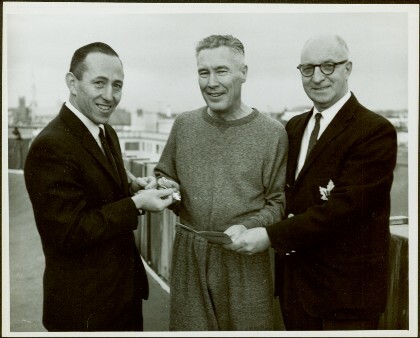 Item is a photograph of Mr. Williston receiving five silver teaspoons with the centennial crest, one for each 100 hundred miles of a personal centennial project which was to run 500 miles, the equivalent of the distance to Prince George. The spoons were presented by YMCA Physical Education Director Art Burgess (left) and YMCA Secretary James A. McConnell. The run took place on the YMCA track in Victoria.